Gros Morne National Park, Newfoundland and Labrador. Emmy Award winning cinematographer Andrew Manske has over 25 years of filmmaking experience, specializing in natural history documentaries and wildlife films. He has worked on over 50 broadcast documentaries airing on networks such as National Geographic, Nat Geo Wild, Discovery Channel, Animal Planet, Love Nature, Canadian Broadcasting Corporation The Nature of Things with David Suzuki, BBC – Natural World and broadcast in over 80 countries around the world. Manske is driven to excellence by his passion for our natural world. Manske is recognized as an elite cinematographer, an experienced director and an accomplished producer. His productions have earned 12 international awards as well as 4 Alberta Motion Picture Awards (Rosies) and his films have been screened at festivals around the world. 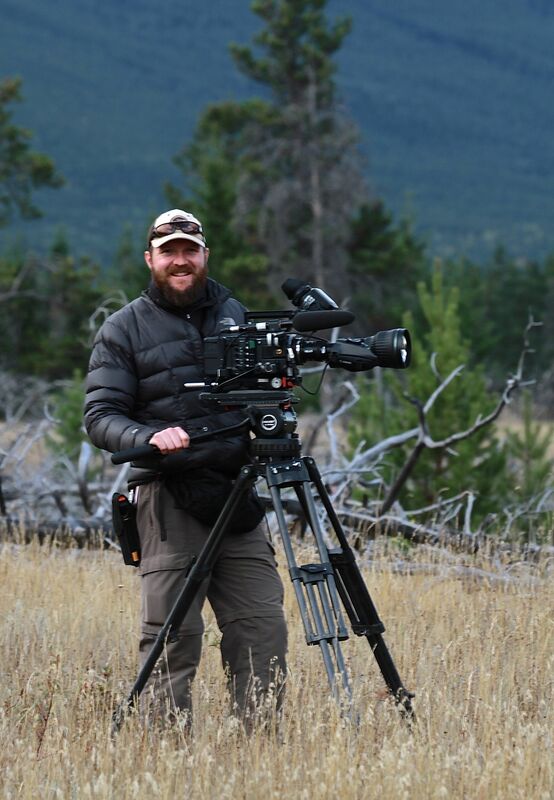 Manske is the recipient of a 2013 Emmy Award for ‘Outstanding Cinematography’ for his work on National Geographic’s Untamed Americas, and his production Wolverine: Ghost of the Northern Forest received 5 nominations from the Alberta Media Industries Association. Manske continues to grow by seeking out the latest technologies as he searches for his next adventure in Japer National Park, Alberta. Excellent place to be this time of year, Ron. Are you still shooting film? Great to hear from you..
Dear Mr. Manske: I teach healthcare professionals about breastfeeding. Your video “Polar Bear Love” would be PERFECT to show in class to illustrate the importance of relationship. It would also get people to experience some emotion, and change the energy of the presentation for a moment, making subsequent learning easier. May I have a copy of that short clip to embed in a PowerPoint presentation? I would not give it to anyone. I sincerely appreciate your efforts to create awareness to such a vital topic. I’m traveling right now and I don’t have access to the video you’d like to use. I’m back in the office after Oct. 20th and perhaps I can send you a link to use then. Is there anything else you need to demonstrate the importance of breast feeding? I think it is so important and if there is anything I can do to assist, with natural history footage, please let me know. I have scenes of other animals nursing as well. Andrew, I know I have been out of the business for a while but I wanted to say a great big congrats for your well deserved Emmy award. You’ve been slogging it in the wilderness for as long as I’ve known you and I’m really glad to see it has paid dividends for you. Keep up the great work buddy. Thanks Jim- Much appreciated! As Albert Karvonen once said…”if it was easy, everyone would be doing it!” So very true. Stay well! Andrew hi! I would really love to have the photos of Sonia’s birthday party to show the family on Saturday! Is there any way you can get some to me? Really enjoyed meeting you and hope your journey home was OK. Sorry I didn’t have an email for you! Just got this. Will send you media today! Andrew: My wife and I would like to put up a wildlife cam along a snowshoe route we frequent to see who is sharing our winter trail with us. Would you have a recommendation for a unit? There are many, many cams on the market and we don’t know where to start. Bushnell makes decent 1080p HD video trail cameras. Make sure to use lithium double ‘A’ batteries! I liked the audio recording you did of ‘Barred owl’. We are making a film in which I would like to use couple of owl hoots. Is it possible to get your permission for the same? Yes, feel free to use the sound. It would be great if you could provide a credit for the use. Thanks! Andrew– I have gone over some of the earlier footage of yours in the Mackenzie Bison Sanctuary and think it is some of the very best that was accomplished with the resources that you had available at the time. Thought you had moved to Florida years ago. I went out with you several years ago-trying to capture snowy owls. Didn’t get a snowy, but get great shots of the great greys.